Cut costs and accelerate the hiring process with pre-verified candidates. The Employer Portal contains all the tools and simple tutorials you’ll need to overhaul applicant tracking and review. Aversafe plug-ins allow you to receive Aversafe trusted data and browse verified candidate details without ever leaving your existing ATS. The RallyHR ATS provides a suite of pipeline management, candidate search and applicant filtering tools guaranteed to help you streamline hiring. Aversafe’s fully auditable Trust Score system helps you form a full and trusted picture of any applicant long before the first interview. Immediate verified updates on any changes to your employees’ professional certifications or personal information provides a holistic view of your team’s status, activities and needs in real-time. 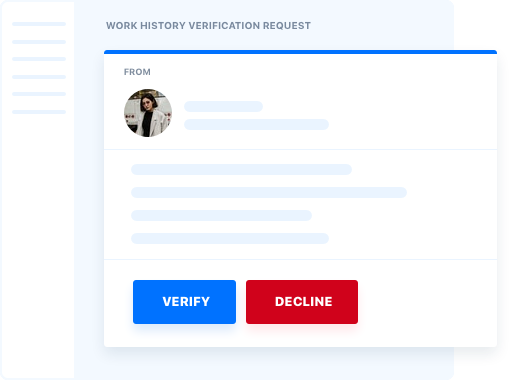 Request access to applicants’ trusted profiles, verify their credential claims, and source their previous coworkers or employers all at the push of a button. Vouch for current or past employees while dramatically reducing the time and effort involved in providing information to inbound background checks. Cut costs and accelerate hiring with pre-verified candidates. How can I trust the applicant data provided through Aversafe? Why should I verify my own employees’ work histories? Can I use Aversafe with my pre-existing ATS and HR software? Are you GDPR compliant? Individuals' credential claims are verified by trusted certificate issues, third party agencies and previous employers or colleagues. These verifications are recorded on the blockchain, so anyone can verify their authenticity and origin. 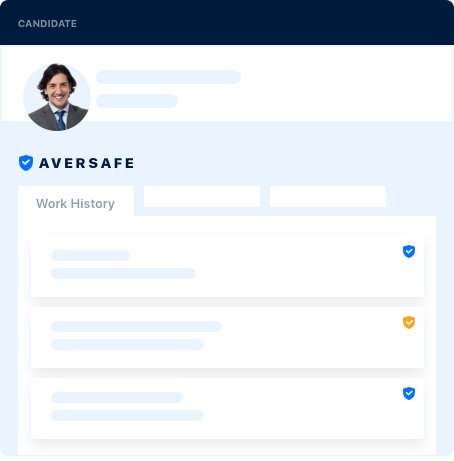 Aversafe also generates a Trust Score for each user based on the sources and number of verifications behind their claims, so you can determine if an applicant is trustworthy at a glance. Vouching for your current or past employees will dramatically reduce the time and effort you’ll have to spend providing information to inbound background checks. Once you’ve verified an employee’s work history claims you can let Aversafe provide the relevant data to all inbound requests, freeing up your HR department for more productive tasks. Verifying your employees can also increase your company or brand’s exposure across the Aversafe Network. Aversafe is building a partner developers program for various ATS and HR software integrations. To find out if Aversafe plug-ins are already compatible with your company’s ATS or HR software systems contact the Aversafe team here. Yes! All data exchanged on the Aversafe Network is stored and held on users’ own personal devices and can be shared only with their express consent. Aversafe’s decentralized data storage model removes the threat of breaches or abuse and was designed from the ground up with GDPR and Privacy Shield compliance in mind.